Hillary Clinton leaves the home of her daughter Chelsea Clinton, where she’d gone after having departed from a September 11 Commemoration Ceremony early. 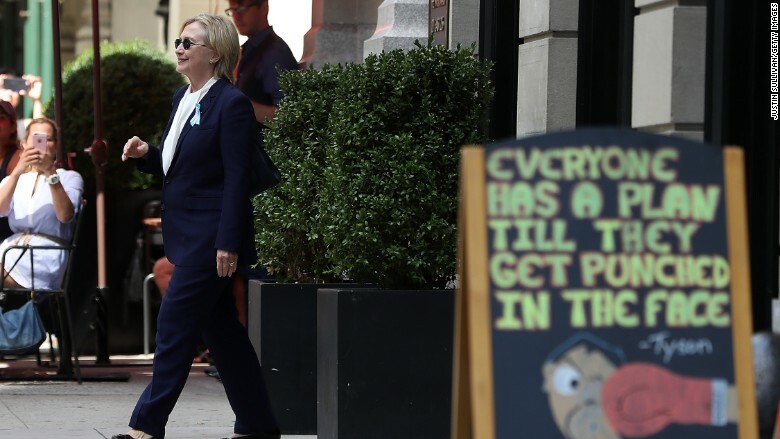 Hillary Clinton’s wobbly, stumbling exit from Sunday’s September 11 commemoration set off a flurry of questions and concerns about the Democratic presidential nominee’s health. For the reporters who cover her, there was also frustration. With less than sixty days until the election, neither Clinton nor Donald Trump has allowed for what’s known as a “protective pool,” a rotating group of reporters that travel with a candidate in order to provide a minute-to-minute account of their activities. Without a protective pool, Clinton was able to leave the memorial site without reporters, travel to her daughter Chelsea Clinton’s apartment without reporters, and leave New York City for her home in Chappaqua, New York, without reporters. That left Clinton’s press pool scrambling to follow her around Manhattan and up to Chappaqua, always a step behind. “Sunday’s events at the Sept. 11 memorial show the importance of having a group of reporters on standby, and close at hand, to cover the potential next president of the United States,” Anne Gearan, the Washington Post political reporter and current chair of the Clinton press pool, told CNNMoney. Still, the lack of a protective pool for either candidate highlights the degree to which both Clinton and Trump have been able to keep reporters at bay and exercise greater control over media access than previous nominees. Indeed, Trump did not even announce in advance that he would attend the memorial. It is rare for presidential candidates to get to September of an election year without a protective pool. In 2008, then-Sen. Barack Obama agreed to a protective pool in June, just weeks after he had secured the Democratic nomination. His opponent, Sen. John McCain, waited until the end of July. In 2012, Mitt Romney waited until August, earning criticism from political reporters and the Obama campaign. George W. Bush did wait until September of 2000 to take on a protective pool, however. “I’m surprised it’s mid-September, just a little more than 8 weeks before Election Day, and neither candidate has a protective pool,” Robert Gibbs, the former White House press secretary for President Obama, wrote on Twitter. “Protective pool isn’t always easy for either candidate or press but there comes a point for each nominee when it must be part of daily life,” he wrote. Clinton campaign spokespeople did not immediately respond to a request for comment regarding the absence of a protective pool.